Traditionally, every week we bring you a list of the top former Golden Knights players who continue their career in pro basketball. #1. Raphell Thomas-Edwards (6'6''-G/F-93, graduated '15, plays pro in United Kingdom) led Leicester Warriors to a victory over the fifth-ranked Reading Rockets (9-4) crushing them 89-63 in the British NBL D1 (second division) on Saturday night. He was MVP of the game. 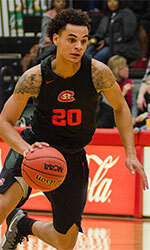 Thomas-Edwards recorded a double-double by scoring 34 points and getting 18 rebounds. He also added and 5 steals in 32 minutes. Leicester Warriors (6-11) is placed tenth in the NBL D1. It's Thomas-Edwards' first season with the team. Thomas-Edwards has individually a very good year with high stats. He averages 24.5ppg, 15.3rpg, 3.6apg and 1.9spg. #2. Matthew Dogan (6'7''-F-94, graduated '17, plays in Germany) contributed to a RSV Eintracht Stahnsdorf's victory against the fourth-ranked Rendsburg (11-9) 91-82 in the German Regionalliga (fourth division) in Saturday night's game. Dogan scored 12 points and grabbed 6 rebounds. RSV Eintracht Stahnsdorf (14-4) is placed second in North group. It was his team's third consecutive victory in a row. Dogan has very impressive stats this year 17.0ppg, 5.4rpg and 1.1apg in 18 games he played so far. #3. C.J. 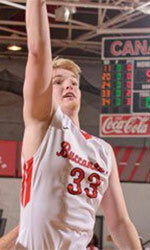 Oldham (6'8''-F-91, graduated '14, currently in Germany) helped Elchingen win their game against the 11th-ranked Koeln Rh.Stars (4-16) 82-69 in the German ProB (third division) last Saturday. Oldham recorded 9 points, 6 rebounds and 4 assists in 25 minutes. ScanPlus Baskets Elchingen (11-9) is placed fourth in South group. There are only two games left until the end of the Regular Season. So now every game will be critical. It's Oldham's first season with the team. This year he averages 6.6ppg, 3.0rpg and 1.1apg. #4. Jabs Newby (6'2''-G-91, graduated '14, plays pro in Spain) helped Algeciras win their game against the ninth-ranked San Fernando (3-20) crushing them 90-42 in the Spanish EBA (fourth division) on Saturday night. He recorded 11 points and added 4 assists. C.D. UDEA Baloncesto Algeciras (15-2) is placed first in Group D-B. Newby's team will play only one more game in the Regular Season. And now that game is very crucial. Newby has relatively good stats this year 13.5ppg, 6.8rpg and 2.0apg in four games. Notice: The list above includes only some of the Gannon University alumni playing currently in pro basketball. Check COMPLETE LIST.